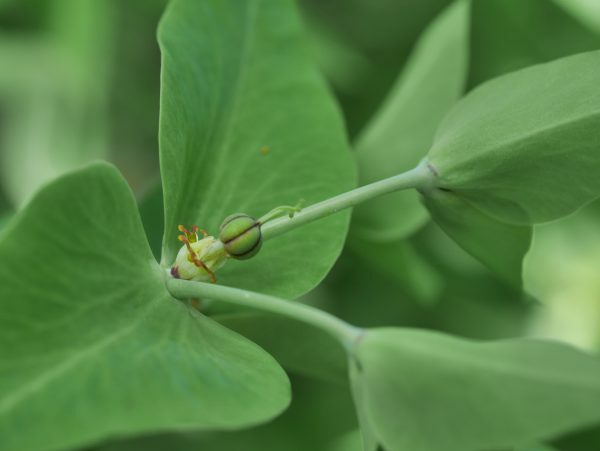 You are here: Home > Blog > Flora & Fauna > Wood spurge and The Euphorbias. Wood spurge can be seen at this time of year, its yellow-green floral structures (cyathia*) appear in late spring to early summer. 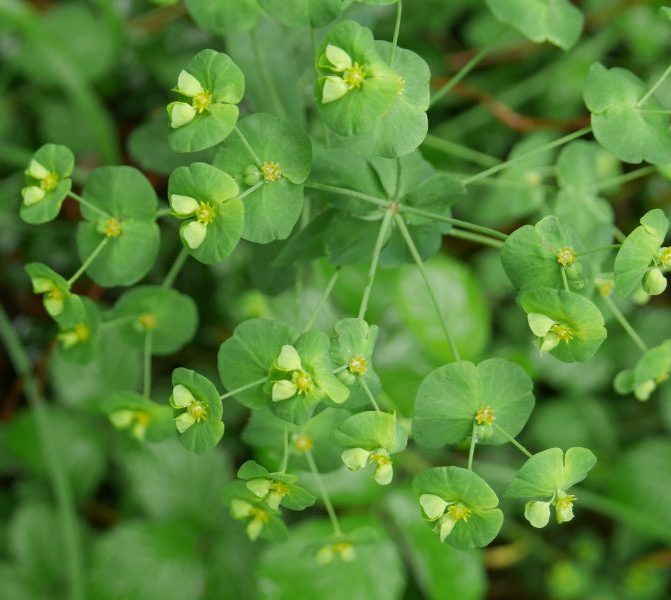 The wood spurge (Euphorbia amygdaloides) is a perennial that can grow to a height of about 80 cm. It flourishes in relatively dry locations, such as the dry shady areas under trees and may colonise an area quite quickly - by means of its underground rhizomes (indeed, it can become quite invasive). 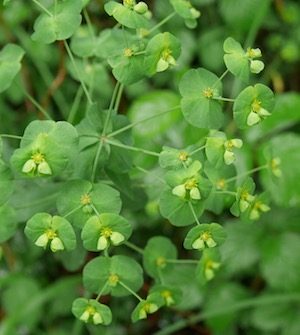 The wood spurge is a member of the Euphorbiaceae (aka the Spurge Family) - which contains some 2000+ species distributed across the world. The species of Euphorbia vary from small annual plants to trees but they share certain features in common, for example, the presence of a white milky sap (latex) and the unique floral structures - the cyathia. The floral structure of a spurge is a cyathium - where the actual flowers are reduced to the bare essentials. The male flowers are reduced to stamens, and the female ones are represented by an ovary with a receptive stigma(s). There are no petals or sepals. 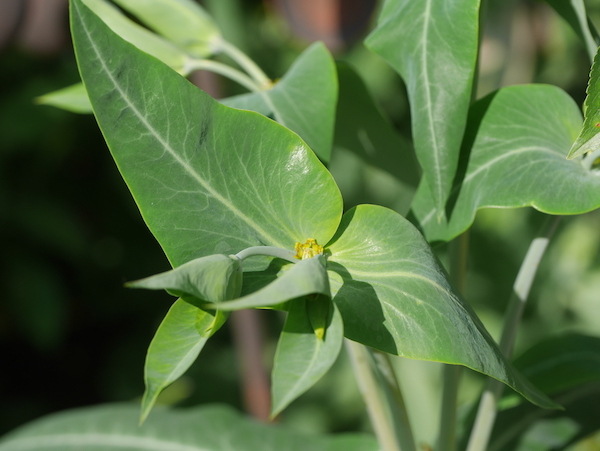 Many of the Spurge Family have developed succulence, that is fleshy leaves / stems (see jpgs below). When the fruits form, they are capsules with 3 compartments (jpg below). All spurges should be handled with care because of their latex. 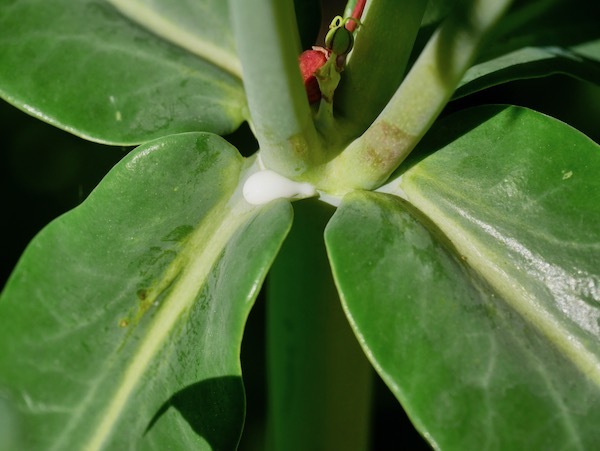 Depending on the species of Euphorbia, the effects of the latex can vary from mild and short acting, to long lasting and dangerous. The latex from the Pencil Tree can cause temporary blindness and significant pain. The active ingredients of the sap are diterpene esters. They can cause burning pain, inflammation or even blistering. 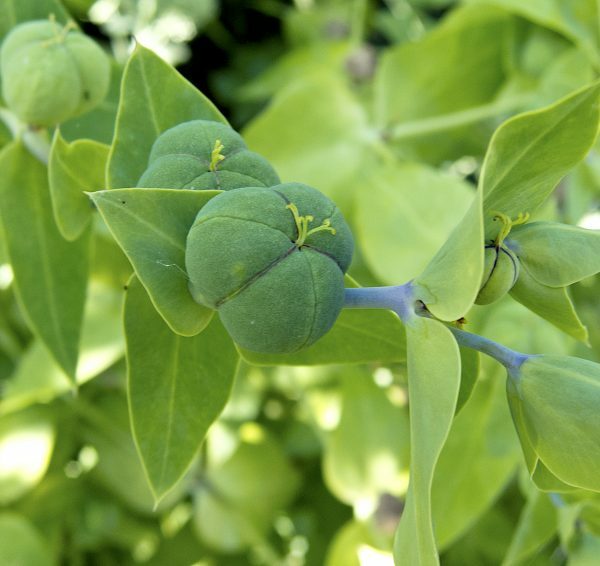 One particularly dangerous member of the Euphorbia family is the manchineel tree (Hippomane mancinella), sometimes referred to as 'beach apple' or 'poison guava'. It is native to the Caribbean and Central America. The tree has another name in Spanish, arbol de la muerte, which translates as "tree of death". It produces a thick, milky sap, which oozes out of the bark, the leaves and even the fruit. On contact with the skin it causes severe, burn-like blisters. This sap contains a number of toxins, but the most serious reactions probably come from phorbol, one of the diterpene family. The milky sap (latex) of the spurges most likely evolved as a a deterrent to herbivores. The latex exudes from the slightest cut / wound to a stem or leaf (photo below), and it congeals on contact with the air - within minutes.